Which Edition Suits My Requirements? Version 7 includes a new mobile webmail client designed exclusively for smartphones and tablets. 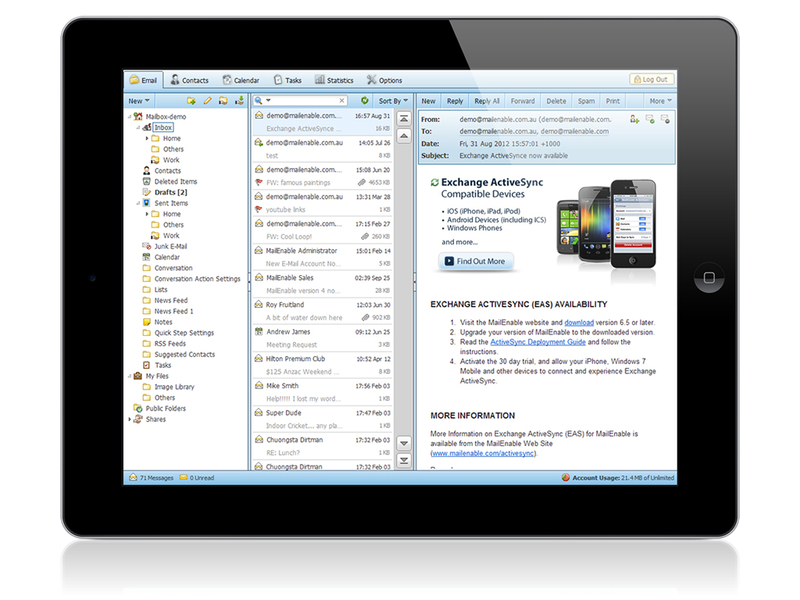 The mobile webmail client is light-weight and has support for swipe scrolling. The mobile client also allows you to automatically login, so you can access your inbox and contacts quickly. You can also tile the screens so they are readily available on your mobile device. The updated webmail interface in Version 7 includes some new features and improvements as well as a new graphical treatment. MailEnable's webmail now allows multiple signatures, sender and reply addresses through identities. Identity support is integrated with Mailbox sharing and resources; so you can reply to e-mails using an appropriate e-mail signature. When you receive e-mails from bulk mailers, MailEnable will now utilize the List-Unsubscribe feature and allow you to unsubscribe within the Webmail interface. When you login to the MailEnable Management Console, you will be presented with a dashboard providing a report on critical server activity and server health. 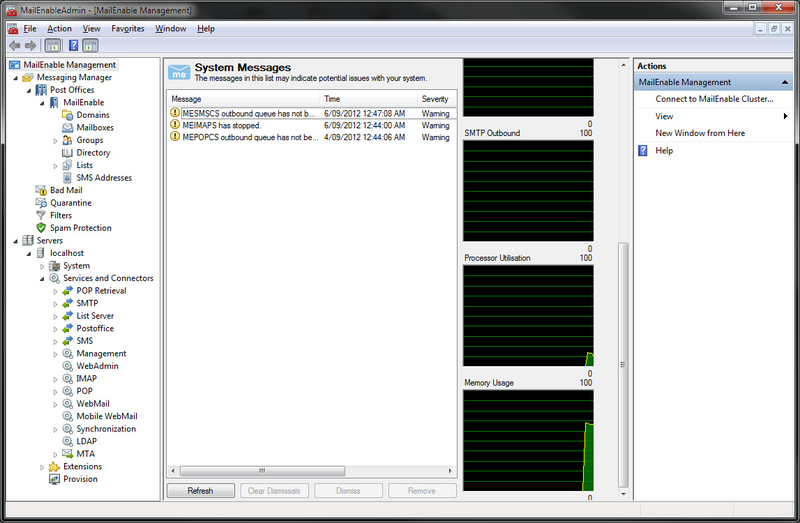 This significantly reduces the need to review MailEnable's logs or the Windows Event Viewer for errors or events. It will analyze behavior and will raise events for the review of the system administrator. Version 7 also includes some significant improvements to spam filtering, providing real time statistics as well as integration with SpamAssassin. When new postoffices/organizations are created, MailEnable will attempt to automatically provision DNS and IIS with the appropriate configuration settings. Administrators can set up default values and customize settings when new organizations are created. These values are then applied when new postoffices and mailboxes are created (ie. you can configure templates for postoffice and mailbox creation). The provisioning function also allows you to define custom actions that can be taken when new postoffices/ organisations are created or removed from the platform. MailEnable's management console has been redeveloped for MMC version 3. The new MMC is now much more responsive and intuitive. 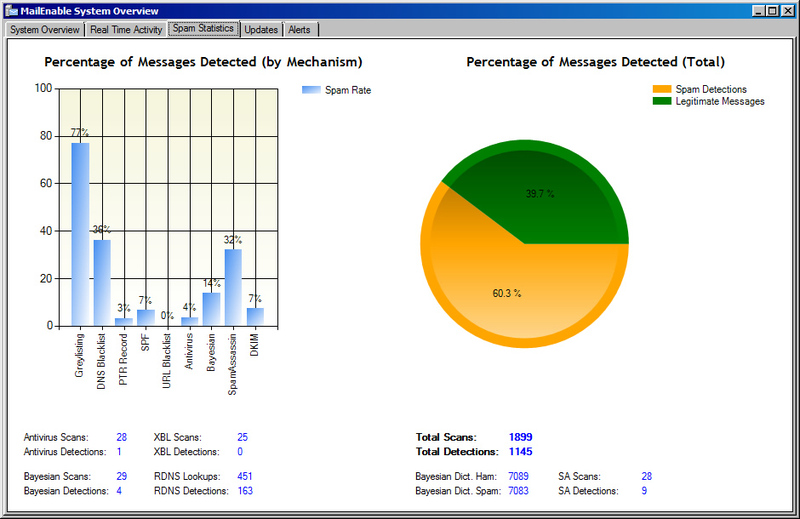 The layout is simplified and is more interactive, showing inbound and outbound connections and system usage. 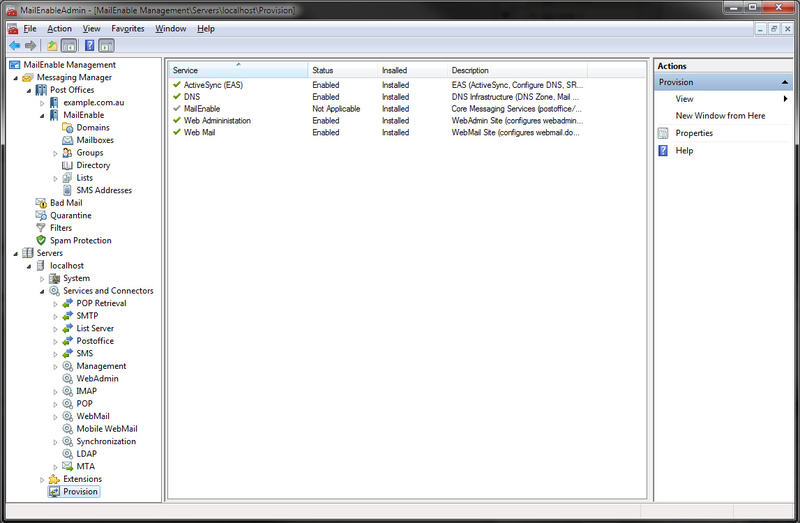 It also includes a Skin Catalogue Manager which provides access to a library of skins that can be chosen and installed (and uninstalled) on the platform. 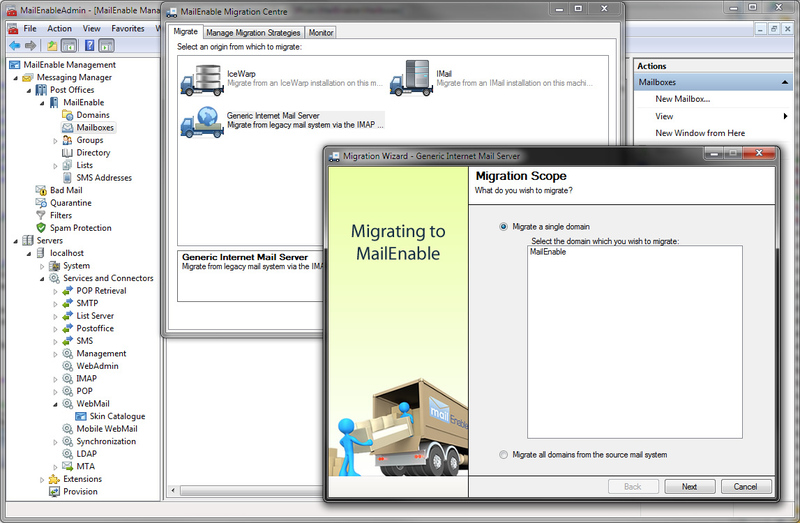 MailEnable's Migration Centre provides a simple solution for migrating from legacy e-mail systems. Using the migration console, it is possible to import mail for a single user, organization or entire server from a remote messaging platform. 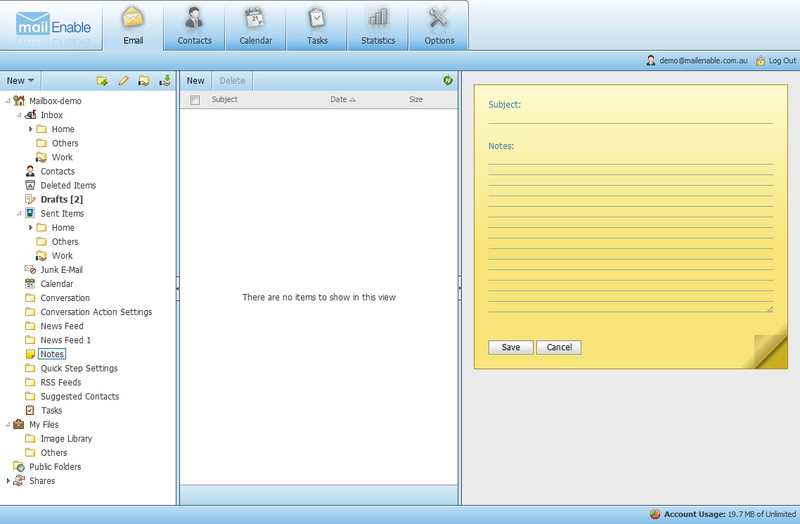 MailEnable WebMail, ActiveSync and MAPI all now support Notes. Notes created within WebMail, MAPI or ActiveSync are now stored on the Server and are published and pushed to remote clients. The WebMail client also includes some usability extensions like multiple file download and improved screen rendering. The ability to drop RFC822 messages into a folder and have them routed to their destination. Developers can now simply drop mail messages into a system folder and MailEnable will inspect the headers and dispatch them. 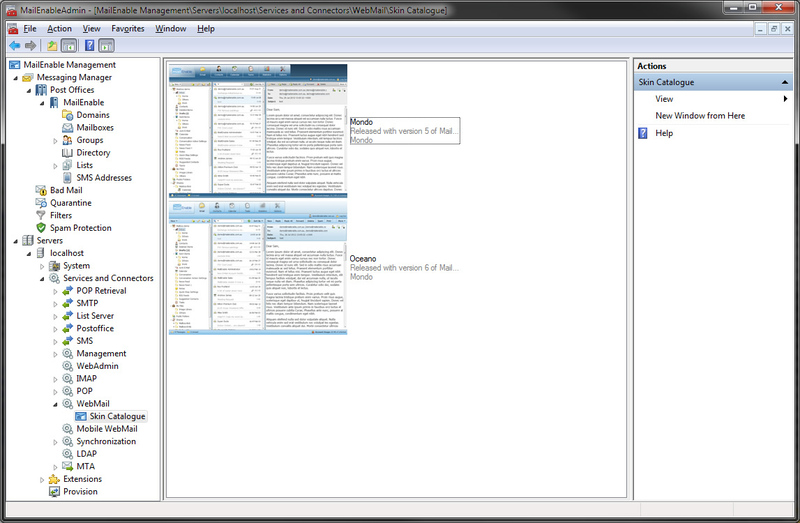 MailEnable Version 7 has been tested against Windows 2012. Version 7 includes a number of installation and management changes that are suited to the Windows 2012 platform. It no longer requires WMI and IIS Legacy Components to administer and install Web Applications. This provides a much simpler and cleaner installation on current Windows Operating Systems. All MailEnable services now run as 64 bit services on 64 bit Windows allowing MailEnable to scale more effectively with higher levels of concurrency. The following table outlines the availability of Version 7 features in respective editions.